Are you noticing lines, wrinkles, or mid-face volume loss that’s causing your cheeks to sag? The Juvéderm® product line used at the Profound MedSpa in Trooper, Pennsylvania, can help. And if you’ve never been satisfied with how plump your lips are, the experts at this renowned medical spa use Juvéderm to help fix that, too. There’s no reason to let the signs of aging affect your joy when you have access to the age-defying services at the Medical Spa of Pottstown. Call today or schedule your appointment online. How does Juvéderm® reduce the signs of aging? Whether you’re bothered by wrinkles or lines appearing as parentheses around your mouth, cheeks that are flattening and drooping with age, or lips that have thinned as the years advanced, Juvéderm offers an injectable dermal filler that can help. Dermal fillers are injected just under your skin to restore needed volume. Fillers lift indentations caused by wrinkles from below, reducing their depth and appearance. Depending on the targeted treatment area, sessions last 15-60 minutes. Why do you recommend Juvéderm? The overall quality of the brand is important. Every Juvéderm filler is developed using hyaluronic acid as a base. This substance occurs naturally in your body. When used for dermal fillers, it offers superior smoothness and a natural appearance that can keep others guessing about what you do to look so young. Juvéderm also has a long, award-winning track record of providing safe and consistent results. Your safety and satisfaction are vital to Profound MedSpa team and always weigh heavily in their decision about which treatments to recommend for your anti-aging therapy. Clients at Profound MedSpa love the effects Juvéderm provides. What dermal fillers does Juvéderm offer? Your initial visit regarding dermal fillers includes a thorough evaluation and detailed discussion regarding your skin care needs and the expectations you have regarding Juvéderm. Your provider will discuss the benefits of each product and which best suits your situation. 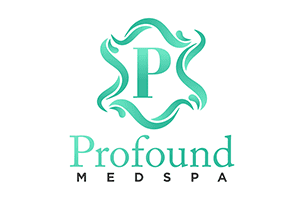 The underlying mission of the team at Profound MedSpa is always to work with you and for you as they make recommendations regarding the services they offer. While it’s not a surgical procedure, needles are involved. But, don’t panic. The needles are small, and the skills your provider has helps keep your discomfort to a minimum. Each Juvéderm product labeled with “XC” contains lidocaine to numb the treatment area once the filler is injected. To find out more about Juvéderm and what it can do for you, call Profound MedSpa for an appointment today, or use the online scheduling service.